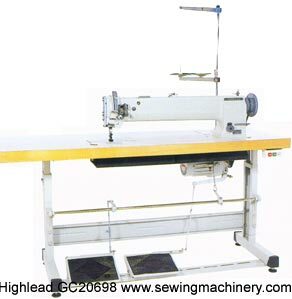 The GC20698-1 is Highlead's industrial long arm lockstitch flatbed walking foot sewing machine. The long sewing machine arm allows up to 635mm clearance to the right of the needle, which is approximately two and a half times the clearance of a standard arm machine. It features a triple feeding action by way of: bottom feed, needle feed and walking foot top feed and is fitted with a large vertically mounted hook & base for use with medium to heavy weight materials. 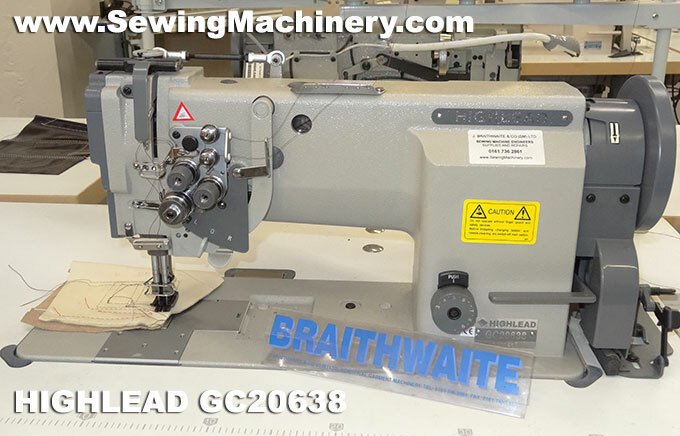 The Highlead GC20698-1 is a long arm, needle feed, walking foot machine, for use on medium to heavy weight materials and is aimed at job applications where a standard arm sewing machine is not suitable. Large covers, upholstery panels, car trimmings, awnings, tents, parachutes, gliders, hot air balloons, sails, top stitching leather etc., + many other large items. Electronically controlled automatic tread trimmer version also available.